Proper grounding/earthing is essential in a computer controlled machine. A couple of points can be discussed in this thread. When this thread was originally started, there was no mention here of SAFETY. 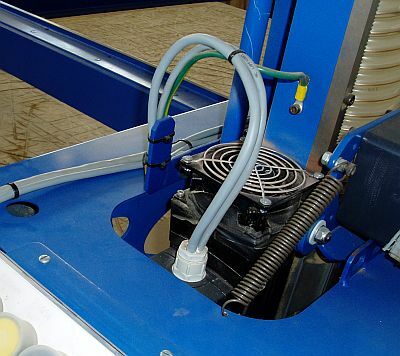 It is absolutely critical that the metal frames of the MechMate be grounded to prevent shocks and damage to the electrical components when things go wrong. Following the principles mentioned further in this post will ensure the safety grounding as well. We use single point grounding to prevent ground loops. The main ground "gathering" point is the alu heatsink under the Gecko's. This plate is convenient because it is big, conducts well, is never painted, and easily screwed into. (Do not use a hard-anodised plate - that anodising is a good insulator). The alu plate is mechanically screwed to the control box, which is grounded to the building's ground. 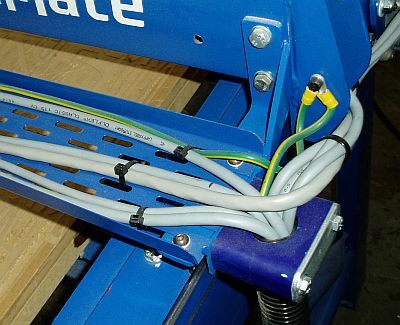 The ground wire in the cable supplying the control box is connected either to the box or the alu plate. The ground cable is the green/yellow one with the yellow crimp lugs on the ends. Use a heavy gauge wire for minimum resistance/impedance. 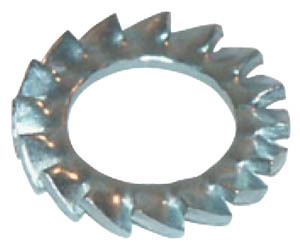 These "star" washers are also used at the alu ground plate in the control box. Alu also needs something to break through its "dirty" layer. Proper industrial grade dust hoses have a spiral wire in them for 1. keeping their shape, and sometimes, 2. for grounding. Their plastic grade is may be chosen for allowing the static electricity to drain to the wire. (If you can see a spiral wire in the plastic, it does not neccessarily mean the pipe is anti-static - the plastic may be insulating the electricity from the wire. A special "plastic" needs to be used) If your hose is of unknown grounding quality, run a bare copper wire along the inside of the hose. 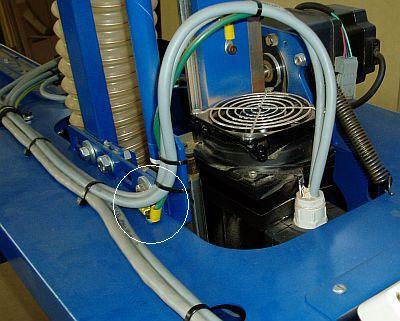 The wire in a dust hose is normally not connected to the MechMate's ground system - it is connected to the dust extracting machine's (fan's) ground. Why must the ground cable be so thick? I am not expert on this but I believe it is because a second ground path (loop) does exist via the v-rollers as well. In cases where there is chance that a bearing may be conducting, we put a very low resistance path parallel to it and hope that the electricity flows via the cable instead of via the balls & grease in the bearing. Excellent grounding articles. Personal experience with these issues, now when there is an electrical problem, first thing I check for is proper grounding, loose connections, etc. I have spent time, $ and frustration replacing parts only to isolate the problem as poor ground or loop or a cold solder joint. 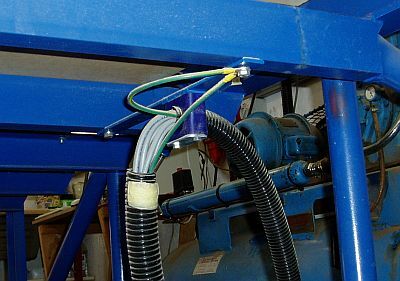 Your suggestion of crimp connectors, large guage wire, star washers and clean metal is sound. Often I have seen sheet metal screws only used to secure the ground lug and they can work loose and make poor contact. I now use bolted screw with star washer where possible. I also use high quality contact cleaner. Thanks for your continued excellent support. One must take care in how the power supplies are wired. - The negative line of the main 70V section is connected to the metal chassis for safety reasons amongst others. - The negative line of the auxiliary 5V must not be connected to any other ground point. Only connected to the GND terminal on J8 of the PMDX-122. All the shields are connected to that alu plate under the Geckos. The shields at the far ends of the cables are left unnconnected and insulated with heatshrink sleeve. This is probably a stupid question but I don't want to assume anything. Are the spacers you used to raise the din rail and the Gecko plate off the back plate made out of metal? They appear to be aluminum but might be delrin. I can't tell from the pictures. I looked at the control box photos others have posted and some look to be made from a synthetic material. Seems to me that since ground wires are attached to the Gecko plate and rail and the control box is grounded, there should be continuity between them therefore the spacers should be made of metal but like I said, I don't want to assume anything and then, later on, have trouble figuring out why the machine won't run. I'm just a few days from finishing all the mechanical stuff and will post pictures. This whole experience has been a blast. I can't thank you enough for being such a generous guy. I'm already thinking about building my next Mechmate so I can have a CNC plasma cutter too. The stuff that sits on the DIN Rail is all insulated from the rail. Nothing touches the rail electrically. So it doesn't matter if the rail is electrically connected to the panel or not. If you use the Green/Yellow grounding terminal blocks, they're designed to pass anything that's connected to that particular terminal block directly to the DIN rail. 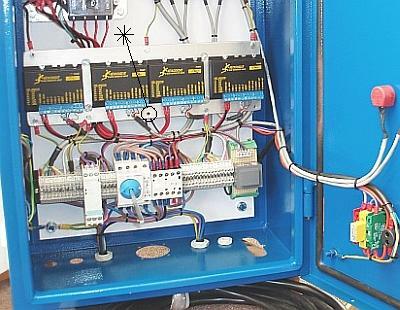 In that case, it would be necessary to connect the DIN rail electrically to the chassis. Mike I hope this is not one of those stupid questions, but what is a ground loop?? All ground connections should be at the same voltage level. Ground is the point from which you measure all other voltages. Good practice is to connect the 'ground' from each circuit to the same bolt so that all ground connections are 'common' to each other. When the various 'grounds' are connected to different bolts, the resistance of the metal between the bolts can cause the 'grounds' to NOT be exactly common. When that happens, one reference voltage is higher or lower than another reference voltage. In a circuit where 1/10th of a volt is the difference between "off" and "on", any difference between 'ground' levels can cause a problem. So, all ground points should be connected to the same bolt. There should be NO measureable difference between 'grounds' on any two circuits. If you do that, things will work better together. Thanks Gerald and Mike. And thanks J.R. I didn't know what a ground loop was either but I had already asked my limit of stupid rookie questions and I wasn't going to push my luck. Doug, don't worry about it. I think I have got you beat on "rookie" questions for some time to come! As always, you made "things" more understandable (I'm not an English Major). I think you have a secret identity and your a prof. at the University of Utah. On a tree, there is only one path in which a leaf can get its nourishment from the soil. There is only one clear route from the leaf to the trunk. That is how a good grounding system should be. If your tree was some weird mutant and the leaves had two of more possible routes back to the trunk, then the nourishment could travel in loops and bypass the leaves. Nah, that sounds too crazy - let's have proper trees without loops. I'm BYU True Blue, through and through. The U of Utah Red is the most likely cause of my high blood pressure (especially during football season, late in the season when BYU and that other team meet). The tree analogy explains ground loops perfectly. We always need exceptions to prove rules! How about the aluminum plate the Geckos are mounted on. Is the mounting insulated or is there continuity with the enclosure? Sorry to be a pain but electrical stuff is not my forte. I used the aluminum plate as the major, and central, grounding point for the whole system. As such, it is very solidly connected to the enclosure with a good copper wire. What might be causing a bit of a problem here the ground loops caused through connections such a bolts & nuts, hinges and bearings. Sometimes we bridge (loop?) those with copper wires as well. For example, a good enclosure door always has a copper wire "over" the door hinge as one cannot trust a hinge to give good continuity. My alu plate is screwed to the back plate with metal fasteners and no attempt to insulate it (as is the DIN rail) - nor did I bother to remove paint from the fastened joint. But, since my alu plate is the primary ground point, all electrical connections to that plate are good and clean. I regard the alu plate as the trunk of the tree. The enclosure itself is just one of the leaves. Thanks a million. That makes perfect sense. I really appreciate the help. Using the aluminum plate as the central ground makes sense. Here in the States there is concern that bonding copper and aluminum conductors together can cause galvanic corrosion and contact problems down the road. I have even read of fires attributed to arcing caused by the resulting corrosion. There is an anti-oxidation/conduction "paste" that is used for situations where mechanically bonding these two materials is unavoidable (such as extending circuits in an old house with aluminum wiring in the walls).